Some time ago I created a poster called “200 Ways to Say Went.” It was quite a hit, especially on Pinterest. Several people inquired if there were print posters available, but I had created it quickly in a program that didn’t permit quality printing. Then a precocious commenter, Kimiko, challenged by my list, came up with another 100 ways to say went. So, I went back to the beginning and recreated the poster, honing the two lists to 250 fantastic alternatives to world’s blandest verb. I also created it in a format that will permit printed posters in case there is a demand. I’m looking into ways to make posters available. Let me know in the comments if you’d be interested in buying one. If you like this, you’ll also like: 100 Ways to Say Said, 100 Ways to Say Bad, 100 Ways to Say Good, & 100 Ways to Say Great! The Words Children Write 2008 – Education Website,(www.education.vic.gov.au/Documents/school/teachers/teaching…). It was very good but tailored to words used in Britain and Australia. Do you know of any similar articles based on American usage? This is very helpful! Is it possible to get it in a text file? These are fantastic! I have bookmarked your page for when I’m stuck. Thank you for sharing. I discovered your page thanks to Retweets for Writers on Twitter. Sometimes procrastinating on Twitter pays off! “To move with a resounding rush or great impetus”. Love this! I would like to buy the poster. Hey Jane, posters are now available at http://posters.writeathome.com! Brian, I would also like copies oaf all 3 posters when available. All posters are now available at http://posters.writeathome.com! I would love to get all 3 posters to hang in my middle school classroom when they are ready. Please keep me in the loop. Thanks. Will do, Christine. Should be soon. Posters are now available at http://posters.writeathome.com! I’d love posters of all of your lists! How can I make that happen? They have been designed and are ready to go to the printer. We have a few things we have to do first, but we hope to begin offering them in Mid August. Stay tuned! I would like a “said” poster. Not sure if you’re checking your blog often, but if you have the poster available, keep me in mind. I would LOVE a copy of this-found this page when I was looking for a place to buy this poster How can I get a copy? I would love to buy a poster! I would love a poster of this as well. I would like to purchase this poster. *Jumping* on this bandwagon a little late…but I’m ALL IN. I would regularly use this at the Writing Center at Weatherford College where I work. FABULOUS. I need 3 of these! They’re great! I would LOVE to purchase this poster!!! Brian I would love a poster of the 250 ways to say went. Do you know when they will be available? I would love a couple of posters. Are they available yet? Sorry, Robyn. I’ll follow up on that project. They should be ready by now. This poster is awesome! I’d love to buy one if you print it! Please, please, please….I am a creative writing/English teacher. I would love one of these as well. Okay. I keep putting this on the back burner. But how can I ignore THREE pleases? 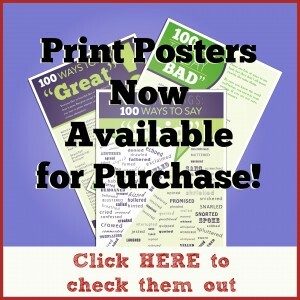 I would love this poster and the 100 Ways to Say Said also! Thank you! I would love a poster of this if you had them printed! Thanks! Thanks for sharing this helpful poster! You’re welcome, Tay. Glad you like it. I would also like a copy of the poster 250 ways to say went. I would also like to know how I can get a copy of the poster 250 ways to say went. I would love a shout to my email when you get a poster to sell/give away. I think they are both awesome. What a great tool for writing. The kids would love this. As an English teacher, this is awesome! I randomly make my students line up outside my classroom and use the sentence “(student name) (substitute for went) into the classroom.” Then they have to act the word out as they move into the classroom. The catch is that they can only use a selected word once. So if someone chose “jumped,” then no one else could choose “jumped.” Having such an extensive list would make this activity easier for the students to come up with a variety of words! Thanks for all the effort and let me know when I can get a poster of this! My friends may also want them. Fun idea, Phyllis. Thanks for sharing. Found this poster on Pinterest; now enjoy your blog immensely! I would purchase a poster if you make one available. In the meantime, may I create a page-sized visual to use with a student I tutor? Many thanks! Certainly, Debra. Thanks for asking. Hi! I found your poster on Pinterest, followed it here, love your stuff. I was wondering if I’d be allowed to share this on my blog, linking back and giving all credit to you? Thanks for your time! Certainly, Nerdygirl. I would be honored. I would love a poster of both “250 Ways” posts. They’re great, and my students would really benefit from me hanging these in my classroom. Thanks! I’m making progress on this. Stay tuned. I would love to have a poster of this, but I did the next best thing. You can use blockposter.com to make a much larger version of the poster. I would love to have this as a poster!! Sojourned, continued, revved, embarked, emigrated, scrammed, embarked, and deserted. That’s eight for me, and two hundred fifty for you, Mr. Wasko. I would love a copy of your 250 ways to say went. This, and the previous one I saw for the word “said”, could be a lot of help to my son! Thank you! If you ever do decide to make a poster format, please post that you did so. I would buy them, for certain. Thanks for composing this list. It is fanTABulous!! I am a former homeshooling mom of four who now teaches 6th grade writing in the public school. We were just talking today in our classroom about ways to replace the words “went” or “go” in our writing!! I had hoped to print off your entire list, but still, I am so grateful for the half I got! If you were to sell this poster, I’d likely buy it! You’re welcome, Jerijo. I keep putting off the poster-printing idea. One of these days, I’ll get it done. Thanks for the encouragement. I’d love to get one – did you ever print them?? To bad this is totally worthless without being able to print it for use in the classroom. Wow. Totally useless? Shoot. I can’t believe I spent all that time on something with no value whatsoever. I guess I didn’t realize that the only possible reason for creating something like this is to post in a classroom. I feel so dumb. Thought of another one: guided. I’d love a poster of this too but in 81/2 X 11 size as I have a very small space and even smaller wall space. I bet you could get IEW to market this with their stuff and sell to their customers as well! “go/went” is on their banned word list. I’d buy one for my CC/personal students. I think I would like a poster for my homeschool room. I tried printing it off, but it only printed the top 2/3 of the poster. Okay, Amy. Stay tuned. I’ll announce on the blog when they’ll be available.